Join us in Our Quest for Ecological Sustainability. RAPs in the Region Panel, 2018. L to R: Gary Murphy (Lismore City Council), Aunty Irene (Bundjalung Elder), Anthony and Guy from Rous County Council, Edda Lampis From ACON, Annie McWilliam from Lismore City Council and Dr Norm Sheehan (Gnibi Wandarhn College of Indigenous Australian Peoples. National Reconciliation Week is held from 27th May to 3rd June every year. As part of Reconciliation Week events, Stefanie Stanley attended the ‘RAPs in the Region’ workshop hosted by Lismore City Council and Rous County Council today (May 31) at the Lismore Regional Gallery. Firstly, we thank Aunty Irene for Welcoming us to Bundjalung Land and sharing her experiences from Cubawee Reserve. Gary Murphy, outgoing General Manager of Lismore City Council, highlighted that only 50 of the 500 local Councils in Australia have a Reconciliation Action Plan – this needs to change. We wholeheartedly agree. 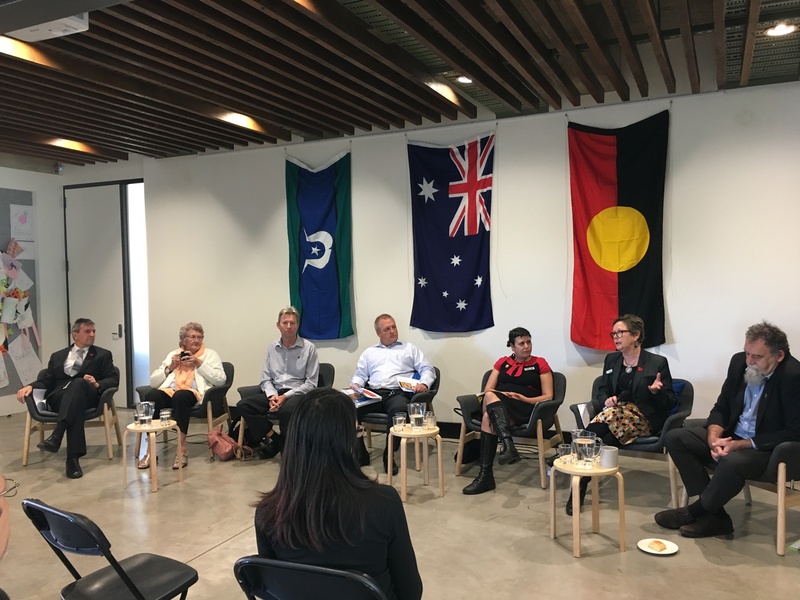 Norm Sheehan from Gnibi Wandarhn College of Indigenous Australian People at Southern Cross Uni spoke about how the principles and ethics of reconciliation can help all people and spans across generations and cultures. Two of these basic principles being caring for each other and recognising each other as individuals – who have a right to be themselves & seeking to understand who we are ourselves. Edda Lampis from ACON LGBTI, spoke about the challenges of developing a RAP statewide for ACON, how the systems and processes we have in place are colonialist and how we can challenge these ideas within our own organisations. Edda also challenged us to think about everyone’s own perceptions of the meaning of reconciliation. Finally, Anthony and Guy from Rous County Council highlighted the start of their journey being the drought in 2003-4 and how the process of ‘going back to the beginning’ helped their organisation connect with the local Elders and look outward and communicate their messages from the heart. Aunty Irene encouraged everyone to keep going and wished everyone the best, through many years and versions of the reconciliation process, she sees partnering with Reconciliation Australia as having real and meaningful change. The theme of National Reconciliation Week for 2018 is ‘Don’t Keep History a Mystery: Learn. Share. Grow’. June 3 marks the historic Mabo decision (1992) dispelling the myth of ‘terra nullius’ and recognising that there is overwhelming evidence of ancient and continuing Aboriginal and Torres Strait Islander agricultural, fishing and cultivation practices across the Australian continent. We (Ecoteam) acknowledge and will never forget the negative aspects of Australian history and we seek to understand and celebrate Aboriginal culture and the long and enduring history and connection of Aboriginal peoples with their Country over tens of thousands of years. We intend to establish meaningful relationships with local organisations and identify ways we can understand and care for each other. Wiradjuri woman and tennis star Evonne Goolagong-Cawley (b. 1951) was ranked as the world number one in 1971 and 1976 alike. She has since started the Evonne Goolagong Foundation, which uses tennis as a meaningful platform for promoting education, health and wellbeing for future generations of Aboriginal and Torres Strait Islander young people. David Unaipon (1872 – 1967), a Ngarrindjeri man, was an inventor and innovator most commonly known for his modified design of the shearing shears. During experiments to attain perpetual motion, Unaipon discovered a way for the blades of the shearing handpiece to move in a straight line, which is the basis of modern shears today. In May 1868, a cricket team toured England comprised of 13 Aboriginal players, most of whom were Jardwadjali, Gunditjmara and Wotjobaluk men from the Western District of Victoria. These players represented Australia’s first-ever sporting team to tour internationally (10 years before the first non-Indigenous cricket team took to the global stage). Ecoteam are proud to support Reconciliation and lead the Lismore community in developing Reconciliation Action Plans (RAPs) alongside other organisations, including Lismore City Council, Rous County Council, Gnibi Wandarhn College of Indigenous Australian Peoples (Southern Cross University)(soon t have their RAP endorsed!) and ACON (soon to have their RAP endorsed!). If you would like to know more about developing a RAP, please go to the Reconcilaition Australia website for a full list of resources. You can also contact Stefanie Stanley our Business Manager for more info on how we went about the process. To view the Ecoteam RAP, visit our Resources page. Thanks to Reconciliation Australia website for providing the information for this blog post, we thank you for your ongoing leadership for reconciliation in this country. Soil and water testing by Ecoteam Director and Senior Environmental Engineer, Lise Bolton, has provided the all clear for the next stage of the proposed Iluka Resort Development. The proposed development is a 40-room resort, roof top spa suites, bunk rooms and creative workshop facilities catering. Project Director, Derk Vanderbent, aims to take an ecological approach to the development starting with recycling the building materials from the old service station site. The resort is planned for completion in 2018 or 2019. Working in the professional services industry has many challenges, in particular, managing the safety of our workers, both in the office, travelling remotely and working on construction sites. Ecoteam takes the safety of our workers very seriously, we all have family and friends to get home to at the end of the day. Following on from our win in the Workplace Safety category at the Lismore Chamber of Commerce and Industry Awards in 2016, Ecoteam were nominated as State Finalists in the ‘Excellence in Workplace Safety Culture – Small Business’ at the 2017 SafeWork NSW Awards in October. 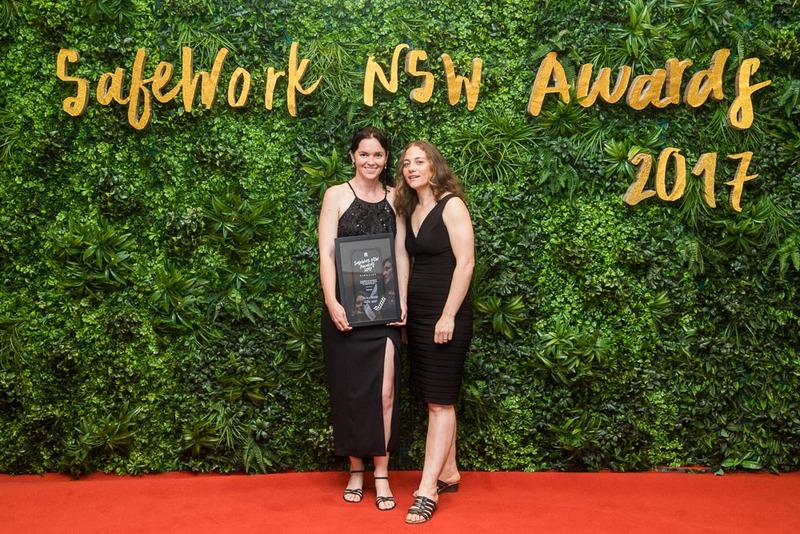 Lise Bolton (Managing Director) and Stefanie Stanley (Business Manager) traveled to Sydney to attend the 2017 SafeWork NSW Awards ceremony. Although we were unsuccessful on the night, Ecoteam are very proud to be in the Top 3 businesses in NSW to be recognised as having an exceptional safety culture. Ensure there are opportunities to discuss non-conformities, near misses and corrective actions. Share your knowledge and admit your mistakes – encourage an open and inclusive workplace. Be on the look out for ways to improve the safety system – there is always an opportunity to make things better; operate with the attitude of Continuous Improvement. Include all of your staff in risk assessments and finding solutions to problems – your workers have the best insight into the work they do every day and can offer simple and effective solutions you may have never thought of! 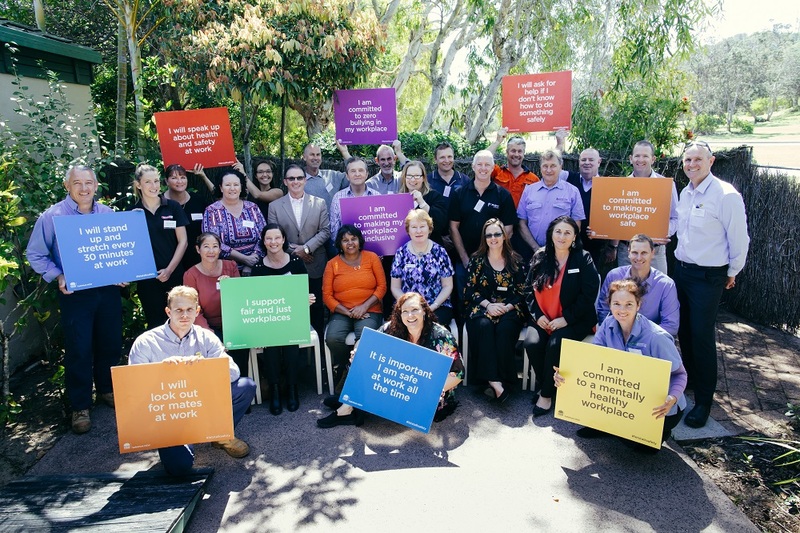 If a worker approaches you with an issue or opportunity for improvement – this is a moment to celebrate, investigate the issue and provide a timely response – this will let all workers know you take safety seriously. These are the foundations for an award winning safety culture and we challenge you to have an ongoing commitment to WHS . Congratulations to all of the SafeWork NSW 2017 Award winners, you are a credit to your industries. If you would like to know more about our Safety Systems, please contact Stefanie Stanley, Business Manager on (02) 6621 5123. Stefanie Stanley, Business Manager, has recently completed training with TAFE NSW to capitalise on local opportunities for civil construction projects, to manage risk and work safely. To capitalise on local civil construction opportunities, ECOTEAM invested in a tailored TAFE NSW training program, to help Business Manager and Board Advisor Stefanie Stanley complete a part-qualification in Civil Construction Management to assist ECOTEAM upgrade their business systems to meet local civil construction industry opportunities and demand. “Our business was tendering for highway construction and bridge infrastructure projects and the skills and knowledge I acquired at TAFE NSW helped to overhaul and boost our business systems to meet this need,” she said. “It was a very practical, hands-on course and we were able to apply the theories learnt directly into our business and systems and also benchmark these against industry standards. It gave us the knowledge and ability to lift our systems accordingly to specific industry requirements,” she said. As a result of the knowledge gained in the TAFE training, ECOTEAM was nominated and went on to win the 2016 Lismore Chamber of Commerce and Industry Business Excellence Workplace Health and Safety award. “Through the awards our company’s profile has been boosted and this is a direct result of working with TAFE NSW,” she said. Read more and sign up for the TAFE newsletter here. Green Army supervisor Lucas Salmon from EnviTE NSW with team members (l-r) Joanne Hetherington, Ethan Wakely, Noah Quinn, Oliver von der Heidt, Dylan Irwin, Kirby Petty, Tashi Matthews and Abbey Mayne. A new Green Army team has started work restoring koala habitat in the north-west of the Lismore Local Government Area (LGA). The Green Army is a hands-on environmental program that provides young people aged 17 to 24 with skills, training and experience in environmental management while helping to protect habitat for threatened species like koalas. 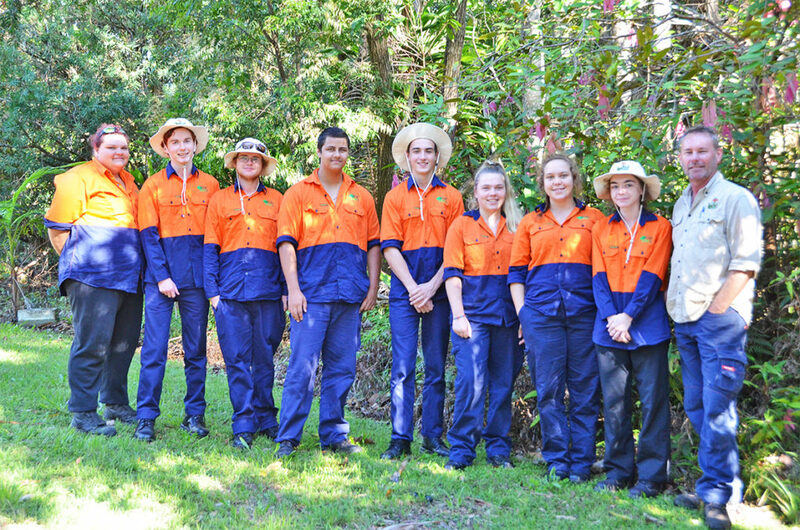 This program contributes to the delivery of Lismore City Council’s Biodiversity Management Strategy, which seeks to improve the natural environment in the Lismore LGA and also provide skills and pathways to employment for young people. Green Army Supervisor Lucas Salmon from EnviTE NSW described the work as “critical” as the koala is listed as vulnerable to extinction under NSW legislation. Lismore is home to one of the few urban koala populations in the state, and a relatively healthy population throughout the rest of the LGA. Nevertheless, the pressures of disease, habitat loss and degradation, road traffic and dog attacks are inflicting a heavy toll. Continuing to restore habitat through tree planting and weed removal is essential to ensuring these local koala populations can thrive and survive into the future. 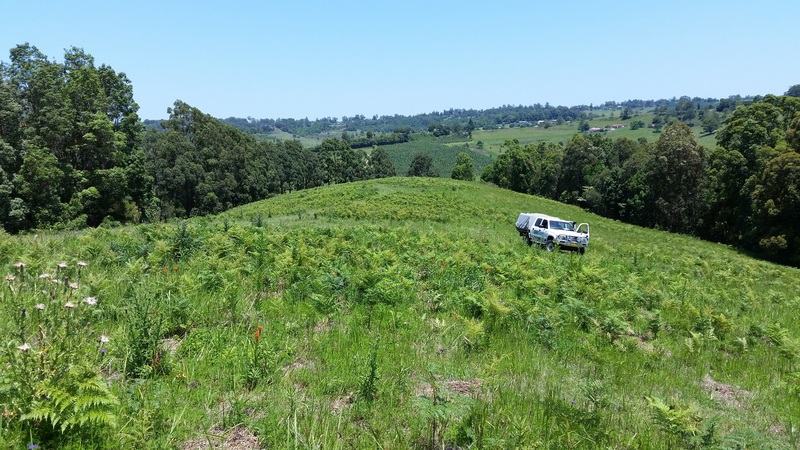 The Green Army team will be working for the next 20 weeks planting around 1200 trees and undertaking extensive weed removal around Nimbin, Terania Creek and The Channon. This is the second team in as many years to undertake this work locally, with the first team focusing on the south-east of the LGA. These projects are supported by the Australian Government’s Green Army Programme and Lismore City Council, EnviTE NSW and Conservation Volunteers Australia. Article via Lismore City Council. Ecoteam supports the Tuckurimba Koalas and Friends of the Koala and you can too by purchasing the 2017 Tuckurimba Koala Gardens Calendar. As well as supporting the Tuckurimba Koalas, $2 from every calendar sold goes to the Lismore based Friends of the Koala, a not-for-profit organisation supporting the vulnerable Koala in our region. Over the past year, Ecoteam has been working with a plastic moulding company to commercialise our SurgeFlow100 Dosing Siphon, an electricity free pump with no moving parts. The prototype arrived before Christmas (a fantastic early pressie!). We couldn’t wait to get back after the holidays to test it! We are happy to say that the prototype worked! With a few tweaks to the sump and fitting connections, it will be perfect. Keep your eyes and ears open for more info as we move towards product release in 2017! For more info on the SurgeFlow100 Dosing Siphon please refer to our products page. Lismore is the proud owner of another recycled Christmas tree in 2016 – a gift from Lismore City Council to the community. The recycled Christmas tree made by Council staff in 2015 was such a resounding success that management and staff thought it should become an annual tradition. 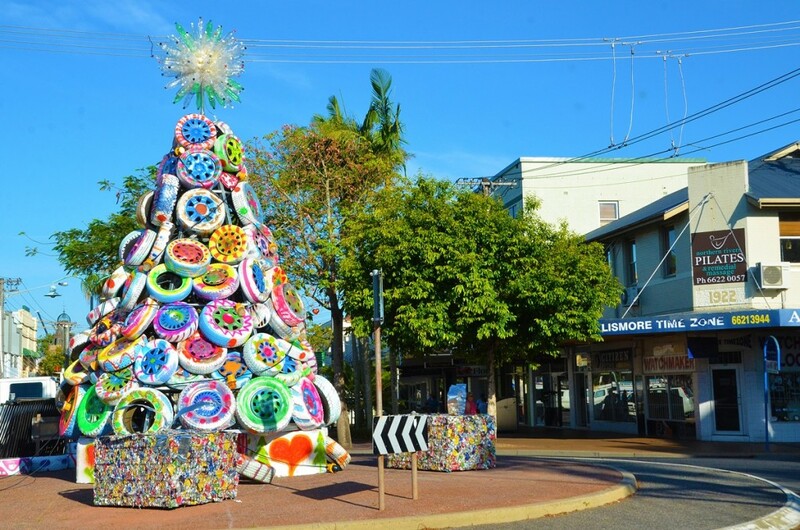 While last year’s tree was made of recycled bicycles, this year’s CBD centrepiece on the corner of Keen and Magellan streets is made of old car tyres and hub caps painted by Council staff and their families. Meanwhile, the bicycle Christmas tree has found a new home in Clunes – a gift to village residents and a chance for visitors entering the Local Government Area to get a taste of Lismore’s personality. “We love the idea of doing a tree each year made of recycled materials,” General Manager Gary Murphy said. The 5.5 metre recycled Christmas tree was made with around 150 car tyres, 100 hub caps, 80 litres of paint donated by Dulux, almost half a tonne of steel, 120 1.25L plastic bottles to form the star, four bales of aluminium cans (a total of 88,000 cans) with recycled aluminium bows as presents around the base of the tree, around 40 old lights from the Lismore Airport runway, and a lot of love and Christmas spirit. Adding to this year’s decorations is a new Merry Christmas sign at Lismore City Hall, which was painted by children at the Lismore City Council display during this year’s North Coast National. “Council doesn’t always get things right, but we love our community and do our very best to make it a great place to live. Christmas gives us a chance to share our Christmas spirit and give something back from the heart,” Gary said. Ecoteam are very thankful to be a part of the Lismore community, and we thank Lismore City Council’s approach to sustainability. We wish everyone a very happy holiday! And looking forward to the Lismore Christmas Tree for 2017! Author: Cameron Hill, Environmental Engineer & Wastewater Management Specialist. Wastewater generation is something we cannot avoid. Everyone uses fresh water for bathing, drinking and washing, with much of this, now waste-water, going down the drain and into the sewer system for treatment at a municipal Sewage Treatment Plant (STP). But what if there is no sewer? Where does your wastewater go then? 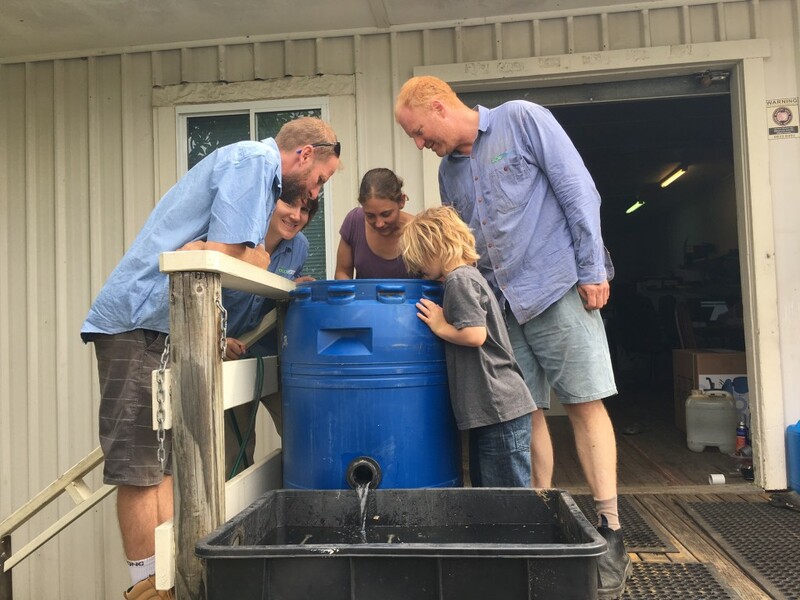 Many households on rural lots have what are commonly referred to as ‘onsite wastewater management systems’. The most basic of these systems is a septic tank and absorption trenches. The more complex systems include aerated treatment and irrigated systems, powered by electricity. 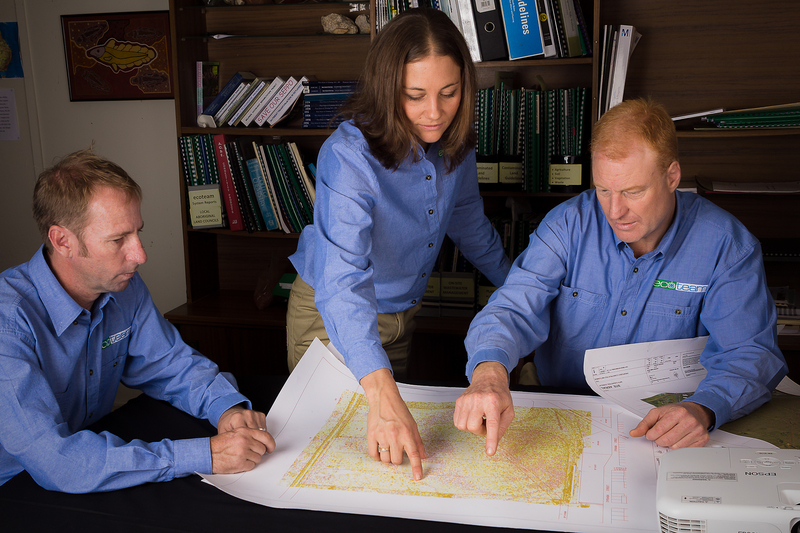 So what are onsite sewage feasibility studies? 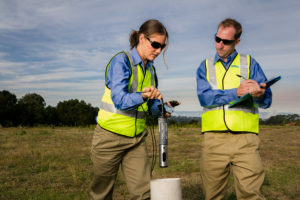 They are an assessment of a site’s capability to handle wastewater disposal in an environmentally safe way, and help determine density of development and lot size requirements and locations. health issues from effluent contact due to overland flow of failing disposal systems. 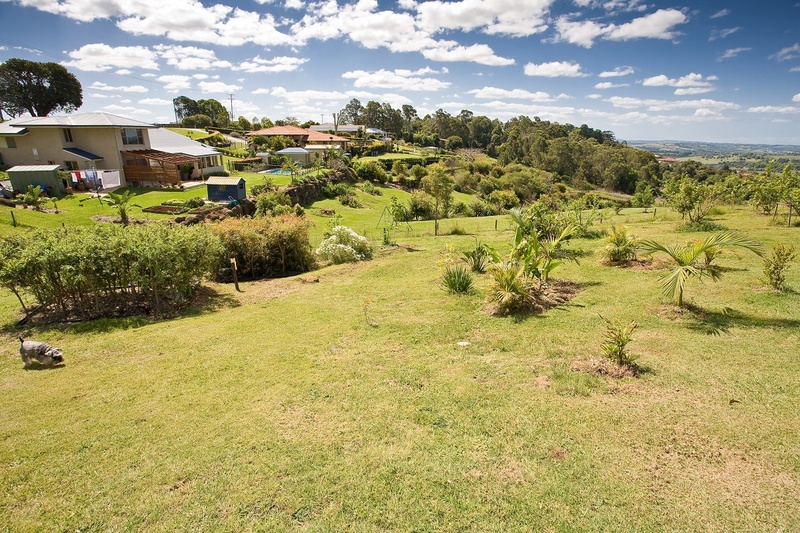 A feasibility study helps councils to determine the appropriateness of a development application for a subdivision or multiple occupancy to ensure land use is consistent with the land capabilities. They are one of the planning tools Council’s use to ensure sustainable development in unsewered areas. Sensitive receptors refers to anything that can be adversely impacted by the disposal of wastewater. Typical sensitive receptors include permanent watercourses, groundwater, gullies, dams, groundwater extraction bores and contaminated sites. They are sensitive due to effluent either degrading water quality by the introduction of nutrients, degrading water security by contamination with pathogens or allowing the mobilisation of contaminants in the soil. Sensitive receptors are dealt with during a feasibility study by ensuring adequate separation distances, or stipulating minimum treatment objectives to ensure positive environmental outcomes. Separation distances are typically done in GIS software, which allows the mapping of features and producing buffers around the features of a minimum distance. This gives the area of land in the development where they cannot consider for onsite sewage disposal. Soil categories in potential land application areas, requiring extraction of boreholes and assessing soil structure, texture, pH and dispersion at a minimum. Steep slopes, as gravity disposal is only optimal on slopes that are less than 15% due to the potential for effluent seepage and slumping occurring from constantly saturated soils. Need for gravity operation i.e. will the house site allow effluent to be disposed via gravity downslope, without encroaching in buffer areas? Shallow soils or depth to water tables, is the soil profile adequate for further polishing and removal of nutrients from disposed effluent? Is sufficient area available in each lot to deal with hydraulic and nutrient load to council and guideline standards. Nutrient loadings are considered next as part of the development. A ‘generic’ household is allocated to each potential lot the developer wishes to produce. Each of these lots will produce a certain amount of wastewater nutrients. Most councils allow an export of some nutrients, with any additional nutrients requiring that the development should be reduced in size, or minimum treatment performance is required for each allotment. The wastewater volumes help to dictate the hydraulic area requirements, i.e. the absolute minimum area the effluent should be disposed over. Which finally brings us to disposing of the effluent. We have found out the areas where we can’t dispose effluent, we have found what the soils are, how much nutrients we are introducing into the system and estimated wastewater volumes. We now apply nutrient and water balance models to find the average wastewater disposal area for the ‘generic’ household per allotment. This step allows the size of disposal areas to be designed likely locations and reserve areas, and identifies any further treatment requirements or reductions in development size. Why do we need to consider all of these things? Basically it comes down to legislation. Ecoteam recently conducted an onsite sewage feasibility assessment for a proposed rural landsharing community development in Larnook NSW. There currently exist many multiple occupancy developments in the area. For this development, a site assessment was conducted and soils, watercourses, slopes and landforms and groundwater were considered for the development. In terms of onsite wastewater management, the site was fairly unconstrained by soil, with most soils around the development consisting of deep silty loam topsoils over sandy clay subsoil horizons. It was found during the site assessment that many permanent and intermittent watercourses surrounded and crossed the property, fed by gullies and upslope catchments. This required excluding much of the “developable area” due to council considerations to keep development away from these water concentrating areas. This was an initially concerning when undertaking the desktop analysis, but onsite inspections realised that much of these areas were unfit for effluent disposal anyway due to steep slopes and poor soils. The site assessment also noted the landform and locations of steep slopes. As the property had long, but narrow ridges between watercourses, many of the sideslopes were too steep to be considered for wastewater disposal, further restricting the area available. This resulted in dwelling locations being confined to the long ridgelines. The constraints identified by the onsite sewage feasibility study could result in a development being disbanded due to decreased profits or over investment. This was not the case for this development. While it was determined that properties would require secondary treatment to meet nutrient export requirements, the total number of dwellings was not restricted below what was allowable. The report prepared for council summarised the critical information for their consideration, and were submitted along with many other planning reports of: bushfire assessment, preliminary contaminated land assessments, preliminary flora and fauna surveys, preliminary surveying plans and designs and town planning applications. The feasibility of wastewater treatment on rural lots in the Northern Rivers of NSW in closely controlled by Councils to protect environmental and human health. The feasibility of on-site sewage management needs to be considered early on in the planning process, alongside other site characteristics like bushfire risk, contaminated soils and presence of protected flora and fauna species. Options for on site sewage disposal systems include the EcoCell Septic System and aerated water treatment systems like the Krystel Kleer. If you would like more information about on-site sewage feasibility assessments, please call our office on (02) 6621 5123 and we will be happy to help. How do I manage my employment needs? As business owners and managers, we are always keeping an eye on the bottom line, making sure we have sufficient cash flow and planning for the future. But there’s something not on your balance sheet, and it’s the most important thing of all – the skills and abilities, an incredible potential of your current staff. Did you know, that for an employee on $60,000 salary, it will cost you $29,000 in recruitment and training costs? And, if they happen leave within 12 months, you can add an additional $6,000 in annual leave and performance management costs. It makes sense to do everything you can to retain your employees. There was also discussion today about the major infrastructure projects happening in our region – being the Pacific Highway upgrade and the ongoing Lismore Base Hospital redevelopment. These projects will require thousands of staff and have the potential to bring many families and workers to the area long term. This has many benefits (to the service area and subcontractors in particular) and may also have some negatives (luring your current civil and technical staff to the major infrastructure projects). It is important to remember that with the ramp up – also comes the ramp down, so keep an eye on your business strategy to ensure you don’t get caught out when the boom ends in a few years’ time. Focus on revenue sources outside the major projects to ensure the long term sustainability of your business and cash flow. What if I need to replace staff or recruit additional team members? If you do need to replace staff (even the best employees leave at some point), there are a number of options available to you. Advertise on Seek – for a $300 fee you will have more applicants than you could possibly imagine, and you can rank and score each applicant to help narrow down who you will interview. How do I attract more applicants? Joanne McLaughlin, panelist at today’s breakfast, suggested that you include one sentence in your ads: “Parents returning to work are encouraged to apply”. We have recently hired our fabulous Accounts & Admin Manager, returning to work following maternity leave, and we can not sing her praises enough. Our new staff member has extensive industry experience in big business and brings a wealth of skills and knowledge to our company. Another suggestion was to offer ‘Flexible Work Options’ in your job advertisement. Flexible work options are an excellent recruitment AND retention strategy. It is important to establish the parameters of flexible work at the start of the contract, including work hours and working from home arrangements. The Queensland Government website has some excellent information that will start you on the right track. Flexible does not mean ‘free for all’ so make sure the parameters of your arrangement are clear from the outset. And finally, make your advertisement interesting and appealing. Have a bit of fun and let your personality shine. Joanne McLaughlin, Human Resources Coordinator, Multitask. Kath Paton, Nortec, representing the North Coast Employment Accord. Thank you to the Lismore Chamber of Commerce and Industry for another fantastic event. Sign up to the LCCI newsletter to keep up to date on industry news and to be notified of upcoming events. Thanks also to Palate at the Gallery for the wonderful breakfast, the mushroom was delectable! The next LCCI event is ‘Business After Hours’ hosted by ETC (employment, training & community). We will be meeting at the Lismore City Hall on Wednesday November 23, starting at 530pm.